And They're The Least Of Your Worries Down Here! THE GRAVE IS CALLING YOU! The graveyard at St. Rita’s Haunted House was filled with zombies, and they were all shambling towards us. They came from open crypts, the surrounding underbrush, and even across the rickety bridge we had traversed only a short time before. With only a camera to defend ourselves with, we took several shots of the lurching ghouls and then decided it was a good time to start moving. The one thing we hadn’t counted on was our own innate clumsiness as we stumbled over our own feet. It was like a scene out of a zombie comedy-pinwheeling our arms to maintain balance, we managed to stay upright and came to a screeching halt just inches away from a half open coffin. Nearby, the cemetery’s gravedigger had been leaning on his shovel and taking in our impromptu novelty act. Nonplussed, he looked at us and said “Looks like the grave is calling out to you”! Zombies and hungry graves are only a few of the things that await you at the 38th annual St. Rita’s Haunted House. There are Crawlers, homicidal household staff, assorted psychos and mad doctors, morticians, clowns, sideshow exhibits, Jason Voorhees, Freddy Krueger, and Tom Flege. Can you spot the one that doesn’t belong? Yep, that’d be Tom, co-chairman of the event and The HOD!! !’s longtime guide to all things haunted up at St. Rita’s. Tom’s doing a bit of everything tonight-working admissions at the front of the queue line, selling tickets, and troubleshooting any problems that might pop up. Tom’s pretty pleased with the night’s attendance-despite the frigid temperatures hovering in the 30’s the line stretches down the hill and brings back memories of the days when crowds would snake up and down several times. Before the advent of pro haunts, the expansion of attractions and consequent increased competition in the 90’s, Tom says that “We used to get 3000 people or more a night on weekends”. Tonight, about halfway through the evening, about 300 people have gone through, putting the school ahead of the pace of last year on the same date (they had 420). Down by the bottom of the hill near the souvenir stand there’s a familiar caped figure striding towards a group of hauntgoers. No, it’s not Superman or Batman but rather the original caped crusader, Dracula. The actor playing Dracula looks familiar and it turns out he’s also a Flege, in this case Tom’s brother. He’s been playing the character and working the queue line for 25 years now. We at the HOD!!! have great memories of him working the crowd in conjunction with ‘stilt Frankenstein’ in the late 1980’s. Currently Dracula’s rounding up a group of wayward hauntgoers who have wandered down the hill and out of line, putting them back at the gate to the front door. Not surprisingly, two more members of Tom’s extended family are at the front door. The artist referred to in hushed tones only as “Tom’s Nephew” controlled the flow of people into the house, making sure that enough time elapsed between groups so that they wouldn’t be running into each other. Tom’s niece Ellie, who up until last year had never seen her picture in an HOD!!! feature, is now two for two in that department. She’s also helping out with controlling the queue line and we’re pretty sure she’s the force behind the Haunt’s new Facebook page. So remember, while you don’t HAVE to be a Flege to work at the haunt, it sure doesn’t hurt! In a bit of news from last season, Tom tells us that the thieves who broke into the Haunt in October of 2012 were never caught. “They did get fingerprints,” he says, “But they weren’t a match for anything in the fingerprint database”. Maybe at some point the crooks will get nailed for another crime, be fingerprinted, and then brought to justice. Nothing could be lower than a punk who effectively is stealing from children, and nothing would please us more than seeing them thrown into a cell with a Big Bubba who found them ‘real purty’. For now, St. Rita’s has taken steps to insure that a similar type of crime won’t happen again. On a much happier note, The HOD!!! finally remembered to ask Tom about the elaborate scene in the tent across from the ticket booth. With an altar, ersatz ‘torches’, a horde of monstrous manikins, and several rows of church pews, it turns out it’s part of a long-standing promotion St. Rita’s has done in conjunction with radio station B-105. It’s been used the past few years for the radio station’s ‘Love At First Fright Wedding’! Chosen from a pool of entries, one couple gets the full ‘haunted wedding’ treatment inside the tent. Flowers, a cake, wedding bands, and a legally binding ceremony performed by Stattman from B105 make up the Grand Prize. And of course in the spirit of Halloween, the bride and groom are kitted out as macabre creatures of the night! Even though we at The HOD!!! love Halloween, this isn’t something we would ever have chosen to do-but hey, if you’re really into the lifestyle, want 15 minutes of fame, and you’re madly in love but maybe lack the money to cement the bargain-it might be just the thing for you! For now, though, during normal hours of operation, the torches are kept lit and anyone’s welcome to have a seat and relax for awhile. At this point Steve Haverkos joined the group. Steve’s also a longtime co-chairman of the Haunted House. He tells us that in addition to the school’s core group of actors, St. Rita’s also features actors from ‘guest schools’ on a nightly basis. Earning credit for their community service, it works out well for both the haunt and the kids-and they get to have a good time as well. “Tonight, we’ve got a group from Hamilton-Baden in there. Tomorrow we’re going to have a large group from Kenton. The Kenton group has about 200 members, but only about 30 were chosen to come up here-getting to work at the haunt was a good incentive for the teachers to hold out”, Steve laughs. The number of actors means that St. Rita’s probably has more creatures per square inch than any other haunt-except for Freddy’s Boiler room, every scene in the haunt had at least two characters and some as many as six or seven! The rotating guest schools also means the arriving ghouls still have that initial burst of enthusiasm and haven’t been fatigued by several days or weeks of working in the haunt. This season the farmhouse’s second best entrance point is being used-the rear doorway that leads straight up the steps to the second floor of the old farmhouse (we preferred entering through the basement staircase a few feet away, but when the vortex shed was installed it eliminated this venue as an entrance). While St. Rita’s is a classic old school (literally!) haunt, over the years they’ve made sure to ride the wave of haunt technology as much as possible. Upon climbing the stairs, the portraits hung along its length begin to speak to our group. It’s a ca-‘coffiny’ of voices that serves to establish that there are some strange things going on here. Reaching the top of the stairs, the bathroom is the next room encountered, and there’s more new tech here as well. As well as the filth and dozens of rubber roaches glued to the wall, there’s also a projection system that makes it appear as if there are dozens more roaches racing across the walls! For a projection, it’s awfully convincing, and the effect is punctuated by the abrupt appearance of an angry attendant-someone needs to suffer the consequences of this mess, and it looks like that someone is going to be you! The bathroom leads into the kitchen, and it doesn’t look like the chef here has washed his hands-no matter, since it’s just as filthy. Shelves heaped with gore and miscellaneous body parts stretch the length of the room. The adjoining dining room has several ghouls wanting to make you the main course, and also has a couple more pieces of new haunt tech: full-motion changing portraits. Normal looking portraits of a man and woman slowly morph into hideous demons-and unlike the basic changing portraits found in stores, their bodies are writhing and moving as well. Tom explains that it’s a simple combination of a rear-projected image using a DVD as its source. Next on the tour is a bedroom with a surprise hidden in the floor-a dead body under glass that illuminates as you walk over it. You’ll shortly meet the pint-sized crazed lunatic that put her there. These first five rooms comprise the ‘traditional haunt’ section of St. Rita’s. Still on the second floor, the theme changes to that of an insane asylum. Doors leading off of the first room feature CGI effects of a woman having her face bashed into a glass panel after she desperately screams for help on the other side of the metal door. There are cages holding prisoners, but just as many of the crazies are running around loose-yes, the inmates are literally running the asylum. One of them slams a guard’s head into a table over and over, and a group of them has taken over the medical ward. They’re not doctors, but have always wanted to be one, and are eyeing hauntgoers as potential do-it-yourself projects! Going down the stairs, another inmate is boxing up a failed experiment inside a coffin and shoving it inside the crematorium furnace. Being crazy does indeed have its drawbacks, as he hasn’t noticed that the girl is still alive-and kicking-but the hungry furnace claims her remains. After that, a little levity might be called for-and it’s found in several rooms set up as a traveling circus. There are Klowns, the wheel of misfortune (with a spinning skull pointing to such wonderful results as poison and torture), a stilt walker wearing a bizarre long-nosed Plague Doctor mask, an escape artist in dire distress, groups of rogue feral children, and most disturbingly of all, a bearded woman who it appears is staffing a kissing booth. The rest of the rooms inside the haunt on the first floor and basement are given over to movie monsters. St. Rita’s is about the only haunt left in Cincinnati where you’ll find movie monsters being used, and they’ve given them the most impressive rooms to show off their talents. Slasher Jason Voorhees of Friday the 13th fame exhibits his handiwork right outside the Psycho Circus-it’s the body of a young woman who’s been cut in two and most of the flesh and muscle on her upper body has been cut off to the bone. But yet-she still lives, as a nearby moonshiner stares on in disbelief. Freddy Krueger from A Nightmare On Elm street is next up, and he’s been outfitted with a few tricks. Not only does his razor glove strike sparks as it glides across the metal railing, but this chilly October night he’s getting ready to wish you a Great Fall-really. A classic St. Rita’s effect ensures that it happens-checking out our caption for the picture of Freddy above will give you an idea how. Finally, a Cave full of Crawlers from “The Descent 2” takes up the entire basement. A cave in and a falling boulder threatens to leave hauntgoers trapped down here with them, a fate seemingly suffered by several haggard looking victims milling about. A handy staircase leads back to the first floor and a trip through a vortex tunnel seems to lead to safety-but that proves to be fleeting and illusionary as the large cemetery teeming with zombies we described in our first paragraph is encountered after crossing a swaying rope bridge. There are crypts, mausoleums, open coffins, and the zombies are coming from all directions. They’re slow, so as long as you stay on your feet, you should be able to make it to safety-but as our exercise in clumsiness showed, nothing can be taken for granted in this living, breathing horror show. But assuming you live to tell the tale, there’s a trailer filled with souvenirs (including $10 T-shirts, the least expensive haunt T’s in town), another serving up food, and in a final show of class and attention to customer service, a sign thanking you for coming out. The latter is an indicator of the family-friendly atmosphere that St. Rita’s is noted for-not dwelling on blood and gore, they concentrate more on providing an exciting show full of proverbial chills and thrills, making it a popular destination for families that want to attend as a group. Hauntgoers Have A Hot Time In The Old Haunt! St. Rita's Haunted House is located at 1720 Glendale-Milford Road, Evendale OH 45215 (exit 14 off I-75 behind St. Rita School For The Deaf). It is open Thursday through Sunday, October 3rd through November 2nd. Hours are 7-11 on Friday and Saturday, 7-10 Thursday and Sunday. Admission is $10 with $6 group rates (minimum size 15) available. Get a $3 discount coupon here (also $3 off for Boy or Girl Scouts in uniform) or pick one up at Costume Castle, Blockbuster Video, KOI Auto Parts, or Goodwill. You can get a multi-haunt discount ticket for St. Rita's and USS Nightmare under the Dark Combo banner-visit the DarkCombo website for details. There're also lights on kid's matinees (kids under 12) on Saturday, October 26th and Sunday, October 27th from 3 PM-5 PM ($2!). Produced by the Greater Springdale Jaycees with 100% of profits donated to St. Rita School For The Deaf. Sponsored by Alleen Company, Hormel, Krogers, Empress Chili, Seven Up/RC, LaRosas, Complete Fastener, Vonderhaars Mkt, Suburban Propane, Blockbuster, Tobor Electronics, Joseph Berning Printing Co, Shaw Farms, RED Construction, Costume Castle, Franks Glass, Franks Auto Body, Noctum Design, JTM, Quality Sports, American Bus, Goodwill, KOI Auto Parts, http://www.hauntworld.com , http://www.scaryohio.com , www.hauntedhouse.com , FOX 19, WSTR TV 64, and B-105 FM. Call (513) 771-1060, (513) 771-7600 or go to the St. Rita website for more information. Where YOU'RE The Endangered Species! IT ALL ADDS UP TO HORROR! As longtime St. Rita’s Haunt chairman Tom Flege guided us to the front door of the old brick farmhouse on the hill, he asked the HOD!!! if we wanted to go through by ourselves or with a group. Well, it’s always more fun to go through with a group-and when it’s four tween girls that are likely to delightfully overreact to everything, so much the better. After informing them that we expected them to protect us from the monsters inside, we waited our turn to enter. At first the laser light show playing against the side of the house garnered their attention (they thought it particularly ‘kewl’ that a set of police lights on top of the unit kicked on during the chorus to Ghostbusters). But soon the girls began to talk about several mundane matters, the most pressing of which seemed to be a math test they were having tomorrow. All of them seemed to agree that math sucked and that they weren’t looking forward to it. With that, the skull-faced ghoul at the front door opened the door and beckoned them inside. Well, the girls lived up to our expectations-they by turns screamed, hid behind each other, tore through rooms at top speed, laughed hilariously, and offered their friends up as sacrifices to the evil beings inside. When last seen, they were dashing through the graveyard towards the parking lot, giggling and screeching with big grins on their face. Their reaction was just what a haunt operator wants to see! While the girls might have sucked at math, even they knew that 37 years of haunting, over 18 scenes of elaborate horror, and 50 monsters all adds up to horror! The Haunted House fundraiser run by St. Rita’s and the Greater Springdale Jaycees has always been a cut above most charity haunts when it comes to having elaborate, well put together scenes and mechanical effects. This year the creators seem to have raised the bar another notch, as the rooms have a level of detail that would make some pro haunts envious. Many of the rooms have mechanical or CGI effects, ranging from ‘electrified’ fences to springing corpses to CGI door displays. Most of these are made on site to save money and allow more of the proceeds to go back to the School. The event has been held in the same Civil War era brick farmhouse for 35 years now. There have been few structural changes in that time-an addition for the Vortex tunnel being the only major one. Despite this, the haunt has managed to stay ‘fresh’ over the years through a clever combination of changing the entrances/exits from season to season and creatively altering the path through the house. The HOD!!! has diagrams of each of the 35 annual events, and a quick look through them would seem to confirm that St. Rita’s has never used the same layout twice. The basement is cool and clammy, perfect for housing the cavern. There are strange architectural features along the way such as brick interior walls with windows (a feature left over when two rooms were added to the upper story). One very atmospheric touch was the open windows on the second floor that had their curtains billowing in the night breeze. Brief glimpses of the outside world could be seen through them, giving the event that extra shot of credibility-not to mention allowing the actors to interact with the crowds outside between groups. You just can’t beat a haunted house that’s actually held in a house! St. Rita’s remains a traditional haunted house-that is, it features scenes that are from a variety of sub-genres and don’t stick to a strict theme. However, this season there seems to be some sub-theming going on. Most of the rooms belong to a larger set that carries a theme throughout. For example, the first four rooms are ‘classic haunted house’, featuring twisted versions of rooms that would be in any normal home. The stairs to the second floor have a set of armor and a shaking chandelier. 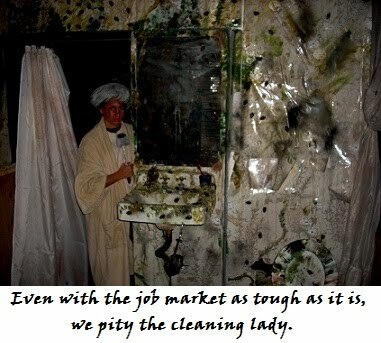 The next room features a disgusting bathroom crawling with insects and splattered with feces-or worse. And the cleaning lady’s looking to get payback from SOMEONE…This is followed up by the vampire’s dining room, which has a few zombies as dinner guests and also features a small gore-encrusted kitchen that the ghouls sometimes use as a detour. Then there’s the doll room, with a large crib and a corpse that shoots out from a bed-not to mention a creepy child playing on what appears to be the remains of several victims in a glass-topped box. Next is a thematic switch to an insane asylum where it’s hard to tell the doctors from the patients. The first room features the medical staff applying ‘shock therapy’ to a caged patient via electric chair. A door houses an impressive CGI effect that shows a huge brute pulverizing the face of a nurse by continually smashing her face into the window, cracking the glass-and her skull. Heading deeper into the asylum takes you to the patient’s cells, where a breakout has occurred. Several of the giggling inmates are seen tearing apart one of the staff, nailing their body parts to the wall. Heading down the steps, more cells are encountered-some with the butchered remains of their former occupants, others holding crazies with chainsaws that shoot up sparks as they struggle to cut through the bars. The next area is the Big Top, entered through a garish looking façade behind a curtain of streamers. The game area of the midway has been overrun with murderous Klowns whose idea of fun is making hauntgoers into the prizes for the next game. Entering a fun house with distorted mirrors seems tame by comparison until a klown comes springing out of a deadly jack-in-the-box and a carnival barker emerges from the wall! It seems as if the circus is located out in the country, because the next scene is of a young lady sitting in an outhouse outside a barn. When the doors are opened, it’s obvious more is missing than just her pants-but you sure can’t call her spineless! Passing by the farm’s cabin ‘plunges’ hauntgoers into Freddy Krueger’s nightmare world as his glove shoots sparks off a wire barrier in the boiler room. ‘Plunge’ is the operative word here as you’ll get a ‘sinking feeling’ from the dropping hydraulic lift that’s a St. Rita’s trademark. The basement cavern is one huge themed area all by itself. In its early years it was generally themed around generic monsters-a witch’s lair one season, the home of cannibals the next, then the lair of a witch doctor. For much of the last several years it’s had a pirate theme. This season might be its strongest yet-a siren warns to clear the area and a boulder from a cave-in threatens to crush hauntgoers. Getting past that, they thread their way through the narrow passages to be assaulted by the bat-headed hybrid Crawlers from the movie “The Descent 2”. The Crawlers blend in well with the fog and dirty walls of the cave, mimicking their camouflage ability from the film (and the cave-in follows the plots of both films as well). Ascending from the depths of the caves brings hauntgoers into a spinning vortex filled with spirits from beyond-and into the arms of even more of the undead upon exiting the house into the graveyard next door. Filled with zombies and monuments that spring to life, it leads into a winding path around the graveyard that’s just perfect for a mad dash to freedom-with a handy stop at the souvenir shop along the way! And once again the presence of Tom Flege’s extended family made itself felt. Tom told the HOD!!! that the haunt has anywhere between 45 and 50 actors inside at any given time. Now, while they weren’t ALL his family, it’s not from lack of trying! The mysterious actor that is known in hushed tones as ‘Tom’s Nephew’ was again working the front door, tricked out as a skeleton in a suit and top hat. He’s currently terrorizing a group of girls who are alternately screaming and laughing. His sister Ellie was working in the cavern, pulling double duty-not only regulating the flow of crowds through the event but popping out of the thick fog to terrorize groups once they found their way inside. Several other members of the family are likely to be found lurking about over the weekend. You might also remember Patty from our feature last season-now entering her 23rd year as a volunteer, she seems to have settled in as the Haunted House’s ticket taker, replacing the much-missed ‘Granny’ who passed away three seasons ago. Right now Patty’s dressed as a witch. If you’re an old-timer like us who remembers the Larry Smith show from local 60’s TV, this means we HAVE to call her ‘Batty Patty from Cincinnati’. She’s running through the rules of the haunt for an excited group of teens. Another volunteer at the haunt was Wendy, who along with her husband runs an elaborate home haunt in Liberty Township. While she doesn’t look anywhere near old enough to have worked on the classic Hamilton-Fairfield Jaycees House on the Hill back in the 80’s (as well as the follow-up events at Fantasy Farm and Lesourdesville), she was indeed a part of that fabled attraction and brought much of what she learned to her home haunt. The layout of her property is perfect for a haunted trail, and some of the photos she showed us (like a giant homemade skull flanked by massive gargoyles attached to a façade on the front of her house) indicate that it would give some pro events some stiff competition. She fits right in at St. Rita’s where many of the event’s organizers have decades of experience putting together and running haunts. Most of the actors don’t have decades of experience-they’re mainly from area schools and civic groups and are rotated on a nightly basis. Tonight it’s a local school, while the weekend will see the event infused with the Boy Scouts who will be setting up their camps on the St. Rita’s grounds. As indicated by our earlier description of the tour, tonight’s group is quite energetic. Despite not being career haunt actors, we were impressed by how the zombies in the graveyard and mausoleum didn’t break character when it turned out the girls in our group knew every single one of them and attempted to engage them in conversation. Other actors alternately tormented the girls, backed off to give them hope of escape, and then moved in for the kill. Throughout the house enthusiasm and energy were high, and there were also quite a few adult actors to add some experience to the mix. An item of interest for haunt collectors out there is that St. Rita’s is selling their event T-Shirts from prior years for only $2 (!). Some of the ‘vintage’ shirts go all the way back to the late 1990’s. As you might imagine, at that price they’ve been going fast. For haunt fans, it’d be a great way to expand your wardrobe at a bargain price! Despite the fact that the House is having a strong crowd for a Thursday night, not everything has been good times up at the old brick farmhouse. After closing down on Sunday, October 22nd, the event’s ticket booth was invaded by thugs who broke out a window and made off with over $850 in proceeds, perhaps as much as $1600. Since St. Rita’s admission price is the lowest in town, it takes a lot of people to bring in that much money. And since 100% of the proceeds go to the school, it represented a big hit to this importadnt fundraiser. We don’t have to tell you that anyone who would steal from children is a first class dirtbag, so if you have any information on the crime please call Crimestoppers at (513) 352-3040 or the Evendale Police at (513)563-2249. One little known fact about St. Rita’s is that it was the inspiration for a computer game for the Commodore 64/128 way back in the 1980’s. Using the house’s layout, it was a classic text adventure that challenged players to make their way through dozens of scenes of horror in order to cleanse the evil dwelling inside. Some monsters had to be avoided, some tackled head on, others defeated with special objects or by using certain features of the room. Upon completing the game successfully and escaping the house, players were treated to a crude animated exterior shot that also used the actual house as its inspiration. It was marketed through the pages of Fangoria magazine along with several other efforts that were based on other area attractions. It was entertaining for its day and while we still have the game disc, we wish we had a working C64 to play it on! St. Rita’s has terrorized several generations of area hauntgoers, and continues to do so with style. With the lowest admission price in town for a quality haunt ($7 after using an easily obtained $3 coupon), it’s perfect for cost-conscious families. There are also lights on tours, flashlight tours available for the easily scared, and the week of Halloween the attraction is open on some non-traditional nights (Monday, Tuesday, and Wednesday). This makes it easy to get up to the house on the hill and help them replace the stolen money while getting a tour through a classic haunt in the bargain. Despite the burglary, St. Rita’s continues to put together an equation that adds up to horror.